If you’ve walked along the Logan River Golf Course Trail or visited the Rendezvous Dog Park recently, you’ve seen piles of downed trees and probably wondered how tree removal can be beneficial to river restoration. Roots hold soil and prevent erosion, right? That’s not always the case. The crack willows that grow inside the Logan River’s channel are not only a nonnative and invasive species but also erosion accelerators. 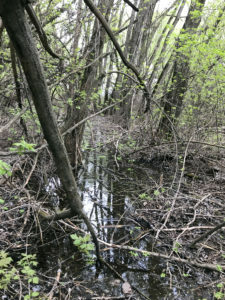 The restoration plan for this section of river includes creating a lush riparian environment by planting native species—coyote willows, sedges, grasses, and bulrushes—under the native cottonwoods and dogwoods. Click on the links below for more information on Logan River Restoration projects.